An Excerpt from "Night Runner"
My name is Daniel Zachariah Thomson. Everyone calls me Zack. I live in the Nicholls Ward of the Peterborough Civic Hospital, and this is the story of how I died, twice. I know what you’re thinking: The Nicholls Ward—isn’t that the loony bin? The nuthouse? Where they put people who torture squirrels or think they’re Julius Caesar? That explains it. Only a loo-loo would think he could die two times and still be around to talk about it. Well, the truth is a funny thing. It can be its clumsy self and it doesn’t matter what anyone believes. I guess it’s like way back in the Middle Ages when everyone and his dog thought the world was flat. That you could sail too far from home and your ship would drop right off into space. The whole planet was wrong on that one, and it didn’t change the truth one pinch. My story is sort of like that. Read it and see for yourself. I’m not crazy. I’m here for different reasons. The other people on the ward aren’t all crazy, either. My neighbours all have mental disorders, that’s true, but these are never as bad as you might think. Certainly not like the villains in Hollywood movies who turn their victims into wax dummies or serve them up for dinner. Most of the patients in the Nicholls Ward are older people. They need help just to eat. I don’t expect to see them appearing in a horror movie anytime soon. They’re all pretty harmless. But I’m different. I stay up all night, for one thing. That’s when my whole life happens—when the others have all taken their happy pills and are snoozing away. I do ordinary stuff, like read, or lift weights. And I run every night, usually outside, but I love movies, so if there’s a good one on TV, I’ll hop on the treadmill instead and watch it in the fitness room. I love video games, too. There’s a big-screen TV in the common room. It takes up half a wall. When you wire up a game, the characters are almost as big as you are. On good nights, my friend Charlie comes to visit. He’s my major contact with the outside world, and because of this, and the fact that my schedule is a bit off, the hospital staff usually let him stay after visiting hours have ended, so long as the two of us aren’t making too much trouble. Chaos is one of Charlie’s specialties. I’m sure he could have a room of his own here. He’d fit right in. Life in a mental ward is pretty routine. Meals, naps, TV time, medication and lights out—it all takes place according to a carefully crafted schedule. It helps keep everyone stable. I have a little more leeway than the others because I’m the only one awake after ten o’clock, but even my nights follow a regular pattern. You can’t exactly set a clock by it, but it never changes very much, either—dinner, free time, exercise, breakfast, reading, sleeping. But all this changed the night a strange old man crashed his motorcycle through the front doors of the lobby and destroyed our big-screen television. I was in the fitness room when it happened. It was about three in the morning. One of my all-time favourites, Terminator, had just ended, but my eyes were still glued to the small television hanging from the ceiling. A woman with hair so perfect it must have been made of plastic was telling me all about the wonders of Miracle Glow hair care products. The way she carried on, this stuff was our ticket to world peace. While she yammered away, interviewing other people whose lives were now fairy tales thanks to Miracle Glow, I pounded the treadmill. My shoes were practically melting. It was a night like any other. Until I heard a noise like an asteroid hitting the building. I felt it, too. A tremor that came right up through the floor. A second crash quickly followed, and the wail of a police siren. In a flash I was out in the hall, past the reception counter and into the lobby. The whole time I was thinking, He’s really done it this time. Charlie, that is. But when I saw the devastation, I knew right away it had to be somebody else. Not even Charlie could have managed this. The lobby was a total disaster. There was glass everywhere. The outside doors were blown right off their hinges. The common room was even worse. The ping-pong table was tipped over and furniture was scattered all over. Actually, this was partly my fault. Well, our fault, Charlie’s and mine. As soon as everyone had gone to bed we’d set it up that way so we could have a ping-pong fight. Charlie had wanted to celebrate the end of the school year, and so we’d spent a good hour pelting one another with ping-pong balls. Forts of overturned furniture were still set up all around the room. And we’d forgotten to put the ping-pong table back. I could see tire marks on the floor where the driver had swerved to miss it. The black streaks led straight to the wall where the TV used to hang. It was on the floor now in about a million pieces. I could tell right away that no amount of Krazy Glue was going to bring it back from the dead. Right in the middle of the floor was the driver. He looked about seventy, with long black hair streaked with white and grey. It stuck out in all directions, as if he’d just been attacked by a tornado. He was on his hands and knees. His long overcoat looked too tight, and his mismatched gloves had the fingers cut out of them. Not the best for crawling across broken bits of TV. Sitting against the wall where the television used to be was his motorcycle, though I’m guessing it wasn’t actually his since it said “Peterborough Police” on it. The siren was still wailing and the red and blue lights were flashing all over the white walls. The old man looked up at me with milky blue eyes. He seemed dazed. Like he was trying to bring me into focus but couldn’t quite manage it. He looked like a homeless person, or an undercover police officer dressed like a homeless person, in which case, his costume was perfect. On the ground in front of him was an old top hat smushed flat as a pancake, and it looked as though there were about ten layers of clothing sandwiched underneath his coat. That explained why he wasn’t in pieces like the television. The padding must have saved him. I glanced over my shoulder at the reception counter, where Nurse Ophelia, Nurse Roberta and the other overnight staff normally hung out. You could usually spot at least one security guard. Someone had to be there in case the police showed up with a new patient, which often happened just after the bars closed. No one was in sight now. I made my way over to the old man as quickly as I could. I was worried he might try to get up and fall back into the sea of glass. Down the hall just ahead of me, a door opened and someone stuck his head out. It was Jacob, my red-haired neighbour. I waved for him to come over and give me a hand. He started up the corridor, then turned around. He did this a couple of times, turning back and then turning away again. His hands were over his ears and he was muttering something to himself, so I just let him pace in front of his room and turned my attention back to the old man. His head was shaking back and forth like he was dizzy, and he was mumbling to himself too, so I put my ear closer to his mouth. “Hurry . . . hurry up . . .” he was saying. I couldn’t tell if he was talking to me or to himself. I asked him if he was okay, but he didn’t answer. He just shook his head one more time and grunted. Then he took hold of my arm. His grip was strong, which surprised me. I wondered for a second if his fingers were going to punch right through my scrubs. As he stood up, bits of glass fell from his overcoat. I noticed a small cut on his forehead and another across the bridge of his nose. Blood dribbled down his face and into the stubble on his chin, which was grey and black and white, just like his hair. He looked pretty gory, but I couldn’t help myself. I just kept staring, I guess because I felt sorry for him. All the Miracle Glow in the world wasn’t going to turn his life into a fairy tale. He smelled like the inside of a wine barrel. And, cuts or no cuts, unless he had a good explanation for all the remodelling he’d just done, when Nurse Roberta showed up, he was in for it. The old man shook his head a few more times, then he looked me over again. It was like he was waking up or something. His eyes came into focus. He stared at my face for a second, then sort of nodded. A smile spread up one cheek. It made his eyes go wrinkly. He clenched his fists, leaned back and turned his head to the ceiling like he owed the man upstairs a miracle-sized favour. A big thank you from the author for sharing this excerpt! 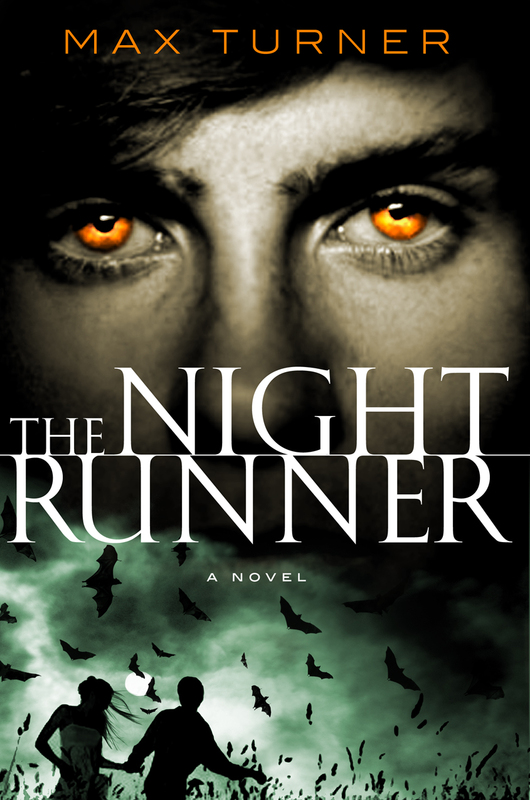 For more on "Night Runner" check out the links below. For more on the author Max Turner and the other books in the series, check him out on his website, Facebook or Twitter. Max Turner is an author of urban fantasy, and a science and phys-ed teacher. He lives in Ottawa with his wife and three kids. He is a lover of games, history, art, music, sports and all things creative. His first book, "Night Runner", was a Red Maple Honour Book and was shortlisted for a Sunburst Award. The sequel, "End of Days", was shortlisted for an Ottawa Book Award. The third book in the series, "New Order", hit store shelves in 2015.